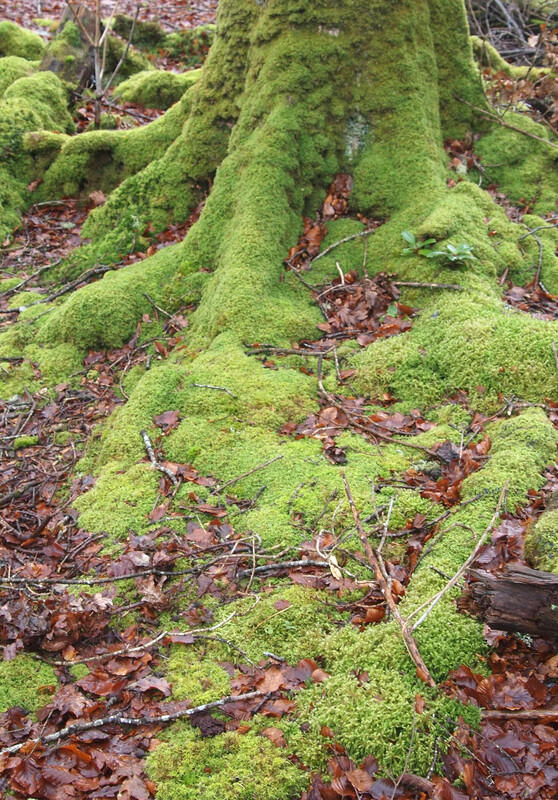 Sara Maitland describes the Moss Witch’s abode as if it were ‘my glade’ on Arran’s NTS Estate. Moss Witch And Other Stories is another superb book by Sara: packed with both information and imagination; each story beautifully written (of course) but it is her nature writing – and thus the Moss Witch story – that captures my heart. Moss in ‘my’ glade grows abundantly along the raised root ridges of the mature oaks and beeches delineating the root’s pattern of spread. I have envisaged removing leaf-litter where it abuts the bright moss to accentuate the colours and reveal the dark earth beneath. This entry was posted in Uncategorized and tagged Arran, Beech, Colour Choice, Glaciations, Glade, Ice Age, Leaves, Moss, Moss Witch, National Trust for Scotland, Oak, Residency, Sara Maitland, Stories, Trees, Woodlands, Writing. Bookmark the permalink.